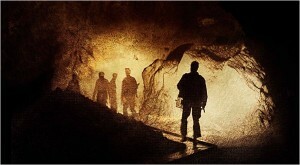 Werner Herzog goes underground in Cave of Forgotten Dreams. A master of both documentary and narrative moviemaking, the great Werner Herzog (Bad Lieutenant: Port of Call, New Orleans) goes the non-narrative route for his 2010 documentary film Cave of Forgotten Dreams. Always interested in revealing man’s drive to exceed the limits of everyday existence, Herzog travels back to the ancient past in his latest quest, which is chronicled in Cave of Forgotten Dreams. The film follows an exclusive expedition into the nearly inaccessible Cave of Chauvet-Pont-d’Arc in southern France. The cave had remained sealed by a rock slide for 25,000 years until its discovery in 1994. On its walls are vivid and sophisticated paintings of horses, cattle, lions, panthers, bears, even rhinos and extinct species; also discovered were hand prints and foot prints – all of it believed to date back 32,000 years. Herzog and his team examine all, with the filmmaker making his trademark nihilistic observations and wry comments. Cave of Forgotten Dreams opened in U.S. theaters on a limited basis in April, 2011 and has since gone on to gross an impressive $5.3 million at the box office and positive notices from the critics. So, the word is out: Werner Herzog, an acclaimed filmmaker who rose to prominence in the 1960s’ New German Cinema wave and the creator of such masterpieces as Fitzcarraldo and Aguirre, The Wrath of God, has crafted a G-rated family movie! And a 3D one, at that!